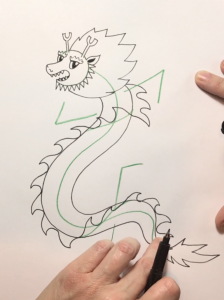 How to draw a dragon for Chinese New Year using simple letter shapes. 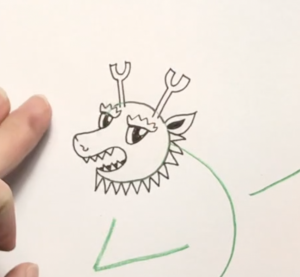 Cute dragon drawing. If you can write the alphabet, you can draw! 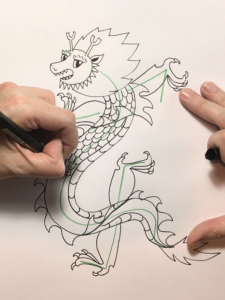 I love to draw dragons around the Chinese New Year—and even though it won’t be the Year of the Dragon until 2024 (2019 marks the Year of the Pig) why not draw a dragon? 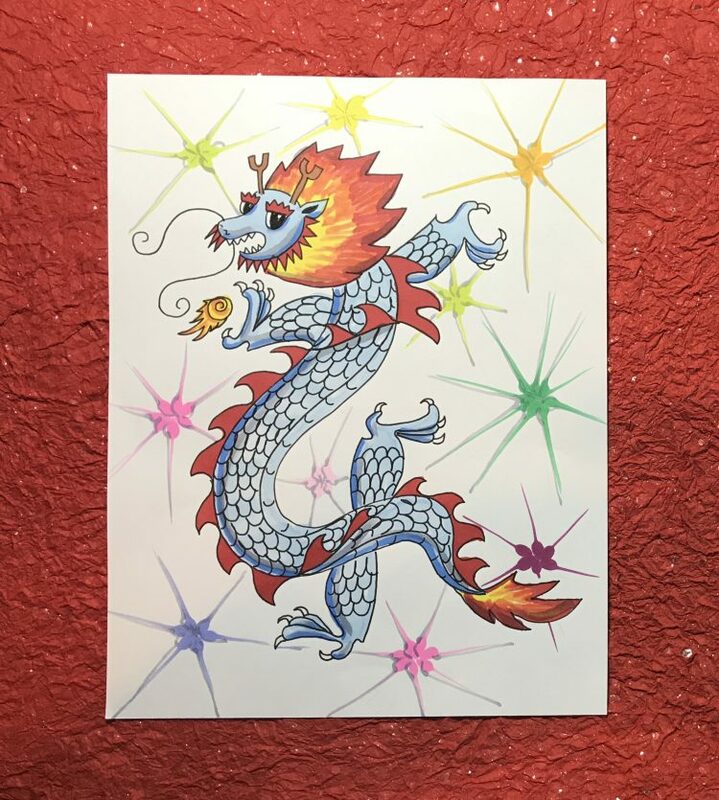 Chinese dragons are lucky and full of power and wisdom. 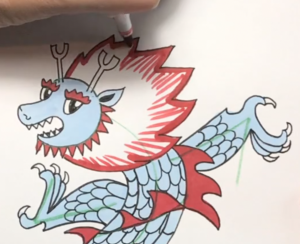 So let’s take a look at how to draw a cute dragon for Chinese New Year step-by-step. 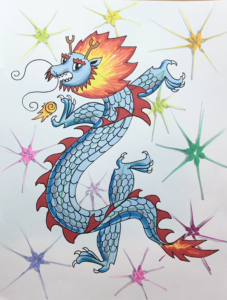 Chinese dragons combine all the zodiac creatures and the letters C, S, L, V and U. 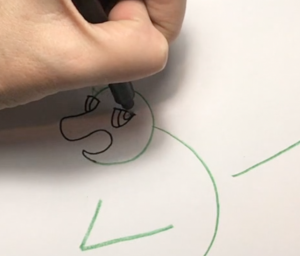 If you can draw those letters, you can do this drawing! Practice drawing scales. Scales are just rows of U’s. Practice drawing the spikes or fins. Long rows of spikes or fins run down a dragon’s spine like rows of cursive C’s. 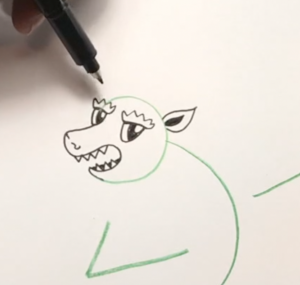 Draw a stick figure version of your dragon. A C-shape forms the head. The body is an S-shape. The legs are capital L’s. Make sure the head is small but the body is nice and long. Leave room for a background. In this drawing, I did backwards C’s and S’s because I wanted my dragon facing left. Begin with the face. A dragon’s face is made up of C, U and V-shapes. 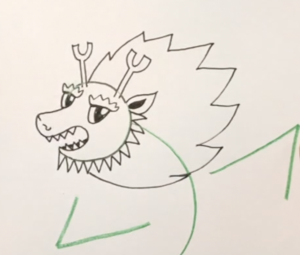 The snout of the dragon sticks out past the C. The teeth and ears are V’s. The eyes are U’s with a straight line on top. The antlers are Y shapes. Dragons from China, unlike Western dragons use their antlers to hear. The teeth are V’s. The eyebrows are M’s. Add V-shapes for the beard. 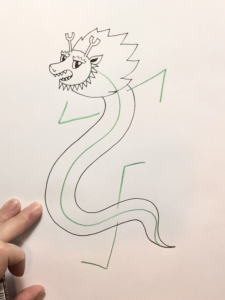 Chinese dragons have a goat’s beard. Add a mane. 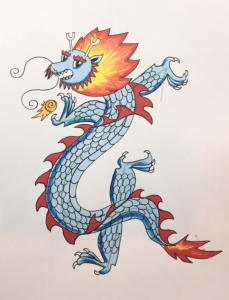 Chinese dragons are said to have a roosters crest or a lion’s mane. 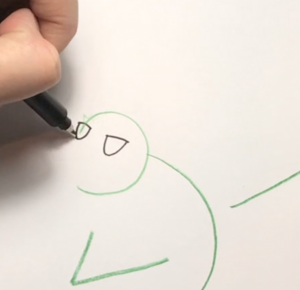 Draw the body on either side of your center line. I made mine wide enough to fit the scales, but notice the body gets thinner towards to the tail. Draw spikes or fin shapes all the way down the back. Add a spiky tail using V shapes. I made a bridge across the body and ran my fins along it so that my dragon appears to be twisting or dancing in the air. 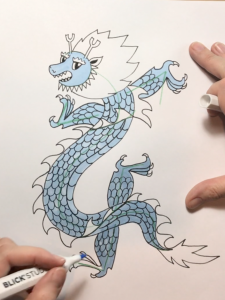 To learn how to make your dragon twisting or dancing, watch our video tutorial. Add a stomach across from the spine. Draw the arms and legs. 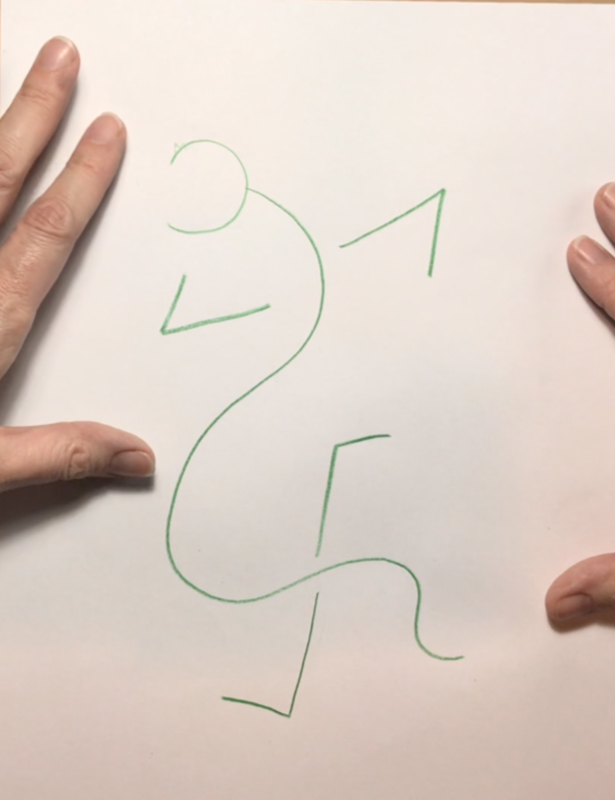 On the inside of the L shape, draw a rounded line, like a bicep muscle, to form the arm. The toes are elongated U’s. The nails are curved V’s. Add the scales. Dragons have 117 scales—out of these 81 are positive and 36 are negative (yin and yang). The number 9 is lucky in China. (9 x 9=81). You don’t have to draw all 117 scales because we are only seeing our dragon from ones side! 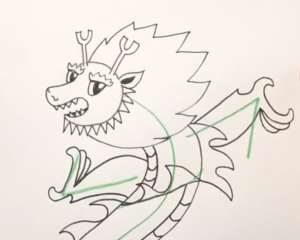 Make sure to draw scales on the arms and legs as well, but you don’t need to draw them on the feet. 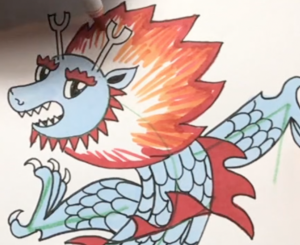 Color and shade your dragon. I decided to make mine a Blue Spirit Dragon who lives in the sky. 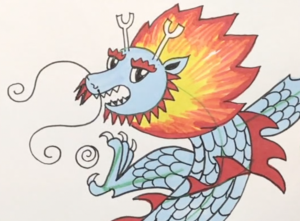 Chinese dragons control the weather and water. 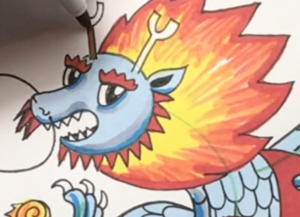 I made my dragon’s mane flame-like, adding red, orange and yellow. I shaded the body using a darker marker on the left side and bottom. I also added a flaming pearl and whiskers. The whiskers a trait from the rat but are also like those of a fish (think catfish!!). The flaming pearl represents wisdom. Color in the body any color you choose! Add a background. I decided to make mine festive, so I added fireworks. It’s fun to draw fireworks in different bright colors using a brush pen. 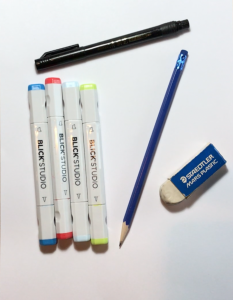 I like Blick Studio Markers brush tip end, which helps give the fireworks their distinct flower-like shape.